Tom Nichols. 2017. 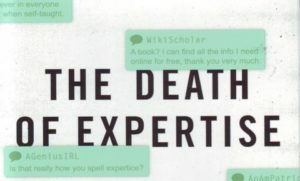 The Death of Expertise: The Campaign against Established Knowledge and why it matters. Oxford University Press ISBN 978 0 19 046941 2. Do you feel we have more information and less knowledge? Have you spent years honing skills and understanding in a particular topic only to be told that you know nothing? Join the band of “experts” who are increasingly told that their opinion is worth just the same as anyone else’s. Over matters of little significance such as football teams or favourite television shows this might well be true but when it affects key areas of science, it might be another matter entirely. We seem to be in a place and time where the value of experience is regarded less than the spin of ideas. The aim of this text is to attempt to lay bare the causes of this modern malaise and to show what the impact might be (or actually is). The thesis is set out over a number of chapters, developing this way. Firstly, there is a need to have reasoned debate. In some aspects of debate, there are those (experts) who have devoted a fair portion of their time and energies to understanding one part of, say, science. Today, these people are increasingly under attack or being sidelined because of the move towards “equality” which assumes one person’s view is as valid as another’s. Of course, the issue here lies in the notion of equality which is all too often taken as “same” whereas these terms are poles apart. We then have to put these ideas through the various biases that each human has – confirmation bias and stereotyping being just two. It looks like we are hard-wired to disagree and prefer our own side! Add to this the commodification and expansion of higher education. In times past, only a select few would go to university and it denoted some special ability. Today, broadening of access and often cheapening of qualification means that anyone with a certificate can consider themselves an expert. Let’s add Sturgeon’s Law to the mix alongside the proliferation of information (as distinct from knowledge) that comes from the Internet. LMGTFY has become a key when we assume that just because we can search for something, we have the ability to understand what it signifies. Commonly seen in medical circles where Google is going to be better than your doctor, it reaches into a generation raised on instant gratification – often assuming that the front page of Google contains everything on the topic you need to know.Next, we need to consider that with instant communications, there’s a need to fill the spaces so people can consume (at least, that’s the argument). Rather than one daily paper, you can have any number synced to your own personal preferences. That, and the need to ship news quickly, means that there is an increasing likelihood of false news getting through. Up to this point, there’s a real trend in the argument that experts are being separated from ordinary citizens by a range of techniques. Let’s not assume that the expert is perfect either because, as we see now, they make mistakes (or, worse, propagate lies or distort science so they can benefit from placement/funding etc. High stakes worlds produce high risk strategies like lying. It doesn’t help the science cause to see them increasing because it further undermines the public faith is a rational and dispassionate science. A final chapter is devoted to showing where we are with the expert vs public debate. Two serious cases- Brexit and US President Trump’s election techniques have created a vast gulf between fact and fantasy. Denigrating experts is handy if you don’t want to be challenged but might actually be serious long-term. What we see is a world that is increasingly fractured and fracturing, where fake news can be either false, or just something you disagree with. More importantly, students seem to be less able to distinguish truth from fiction. If that happens, we all lose. Read this book. Disagree with it if you like. Consider what might be the consequences of a system where nothing is accepted and see how global warming fits in! Given the option, this would be standard reading in any university department of education (along with the course to sort the problem out! ).